Acupuncture is a safe and effective means of rejuvenation using a completely holistic approach. There are records to indicate that for many centuries Acupuncture and Traditional Chinese Medicine has been used to achieve aesthetic results but this has only recently been introduced to the Western World. Cosmetic acupuncture has a dual role. It works locally on facial lines but it also works holistically by addressing underlying problems. It involves the direct application of fine needles to the face which results in the reduction of deep lines and the elimination of fine lines. Drooping eyelids or jowls can be firmed up without dramatically changing the shape of the face. The oxygen supply to the face is improved. The acupuncture treatment is followed by lymphatic massage to drain away toxins. This treatment also works indirectly by treating additional acupuncture points to correct imbalances in the body. Dark circles or puffiness under the eyes are treated systematically. Recent research undertaken in Sweden has proven that acupuncture improves the collagen levels. The change is gradual and therefore intervention is not quite so obvious. 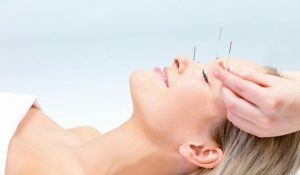 The benefits of acupuncture as a means of rejuvenation are that it is not simply a facelift but the whole body is revitalised by the holistic approach resulting in a healthy glow.